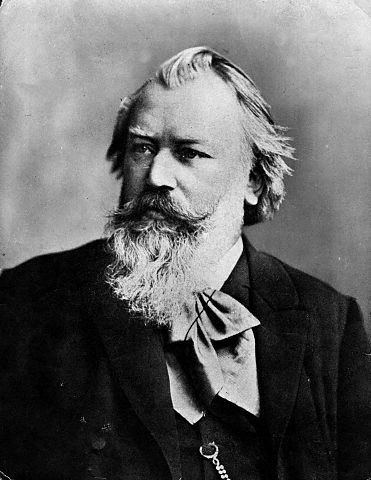 JOHANNES BRAHMS (1833-1897): Symphony No. 2, Op. 73, in D Major (1877). Scholars have often speculated that Brahms worked on his first symphony (completed in 1876) for over 20 years because he, like so many 19th-century composers, was intimidated by the mighty nine symphonies of Beethoven. Perhaps there is also some validity in comparing Beethoven’s Symphony No. 6 - a monument of that composer’s “middle period” - with this Symphony No. 2 of Brahms’s “middle period,” as both are works of a light and sunny nature. The Second Symphony of Brahms was composed during a visit to the Austrian Alps in the summer of 1877. It is basically a conservative work, preserving the structural principles of the classical symphony, in that two lively outer movements frame the inner movements: a slow second movement followed by a brief scherzo. The first movement is predominantly tranquil in character. The cellos and basses open with a key three-note motive, which is developed throughout the movement, before the horns gently announce the main theme. A secondary theme appears in the remote key of F# minor. A coda, marked sempre tranquillo, leads to a peaceful conclusion. The second movement, dark and sombre in character, is dominated by a brooding subject first introduced by the cellos, and the tension is only briefly relieved by a contrasting syncopated theme introduced by the woodwinds. There is also a third theme which is treated fugally. In the third movement, a bucolic oboe theme, accompanied by pizzicato cello, is twice interrupted by a contrasting more lively subject in duple metre, before the movement closes with a tranquil reminiscence of the oboe theme. The main theme of the finale, introduced pianissimo in the strings, is abruptly interrupted by a full orchestral tutti which repeats and develops it. A lyrical second theme is introduced by the violins, and both are developed, as the work draws to a triumphant conclusion with brass fanfares and timpani drumroll.